I’m not fond of the zoo. I went to several, and each time I wanted to let the animals out – figuring it was better for them to take their chances in the wild. But I’ve gotten older, and realized there is a reason for the zoo – but I still don’t visit very often. When I was in New Orleans I made my way to the Audubon Zoo, a regular ritual of my visits. 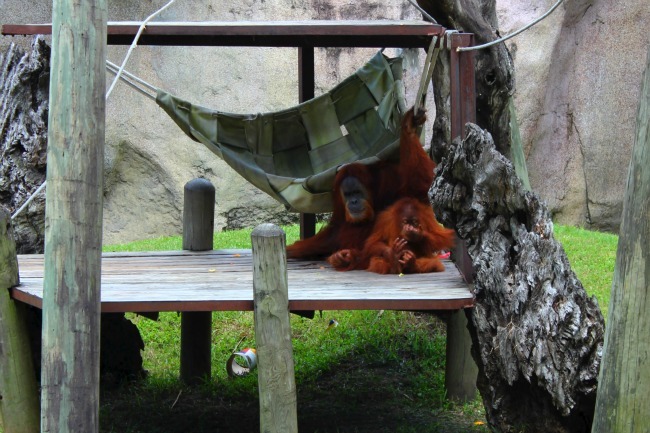 We stopped to hang out at the enclosure where the orangutans live, noticing there were two on the center wood platform, sitting in the shade. As I saw the older primate fuss over the younger one, it made me realize why people like to come to the zoo – seeing the behaviours they do themselves played out by the animals. Every parent was describing the animals as Mums, Dads and kids – a family. As I came with my family, and others came with their families, we were all there to see the animal families and how they interacted. I thought about how when we travel we’re often seeing and witnessing family behaviour – the good, the bad and the ugly. Doesn’t this make us better for it? It does. But it also made me long to see the orangutans in the wild, climbing through trees and figuring out their days on their own. Would there be a day where I would find myself in Borneo, able to see these intelligent creatures high up in a tree? I was glad that these apes were safe, not threatened by man, violence, environment or destruction of their habitat. But I was still rooting for them to get out – that they were secretly planning how to leave – and were waiting for the signal.